– High Definition 4k demo images are included in the optimized small-sized download. 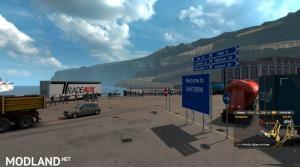 – Stand-alone map for ETS2 ver. 1.34 and 1.33 (tested) and most likely compatible with 1.35+. To install, create a new profile and before saving it, click “mod manager” selecting “Sant_Pir_Kor.scs” and then click “playing module” selecting “Sant_Pir_Kor.mbd”. 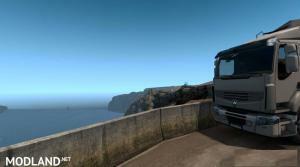 – For ETS2 truckers who like and enjoy real-life driving. – Drive on nothing less than the real, challenging roads of the world famous greek island of Santorini and get the feel of what’s like to drive on an island of the greek Cyclades. 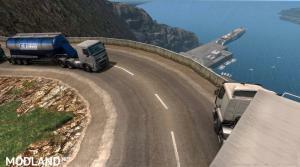 Or on the real E94 Motorway from Piraeus to Korinthos for that matter. – Real and accurate 1:1 roads with real elevations. – Realistic three-dimensional 1:1 topography. – Realistic vast vistas: Try a job e.g from Oia to Fira at sunrise around 06:15 at high graphics settings and a FOV around 80 degrees -that is, if your PC can afford that- and you’ll see what I mean. – Over 150 real 1:1 Kms, equivalent to over 3000 drivable kms on a conventional ETS2 map. – Animations: Watch Jumbos taking-off and landing at Santorini Intl. and watch out for hikers. – Sixteen cities available for jobs. – All truck dealers available – purchase any truck brand you wish. – Greece2: more bug fixes and improvements. you still may have issues with some map after changing this. If so, restore the original setting. – Low fps – try one or more of the following: lower screen resolution, uncheck “Antialising”, uncheck “HDR”, reduce “Scaling”, all this of course, at the expense of visual quality. – If at the end of your very first job, no white pattern appears, upon which you should park the trailer, then change the “parking difficulty” temporarily from it’s current setting to something else e.g. from “skilled parking” to “safe parking”, complete the delivery and then change it back to whatever setting you like. You won’t have to do this again in the future. Major crash zone near 50% between Megara & Kineta. Entering tunnel from Megaral. 100% Damage, catastrophic fall through space but landed back on map, pinned by railings.